This modern house has a unique feature in its exterior that you need to see. The exterior of a house may vary depending on the budget of the owners, design preference and the availability of materials around the area. But some homeowners do not just choose for a house exterior that has a unique design but would also like to use a unique material for it. We have seen homes that are wrapped in glass while there are others which are covered in copper or even zinc. Yes, that is indeed different from the usual concrete and wood. 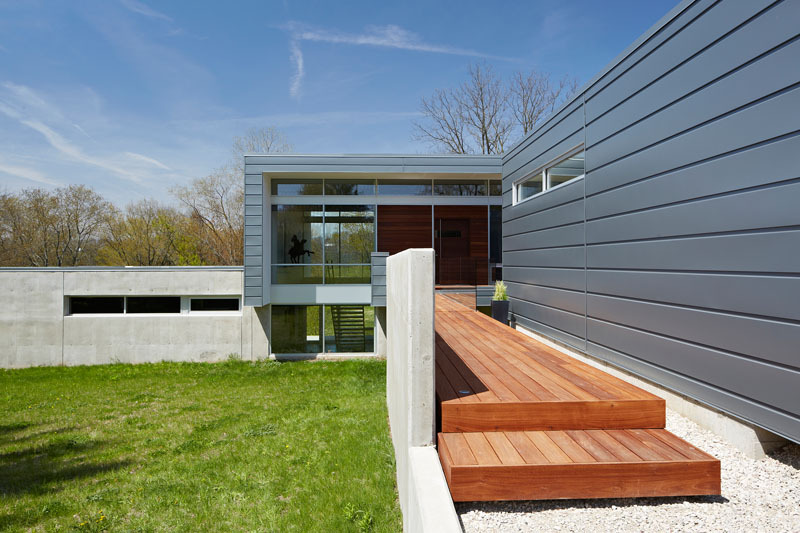 But today, we are going to feature a home which has an exterior clad in anodized aluminum panels. 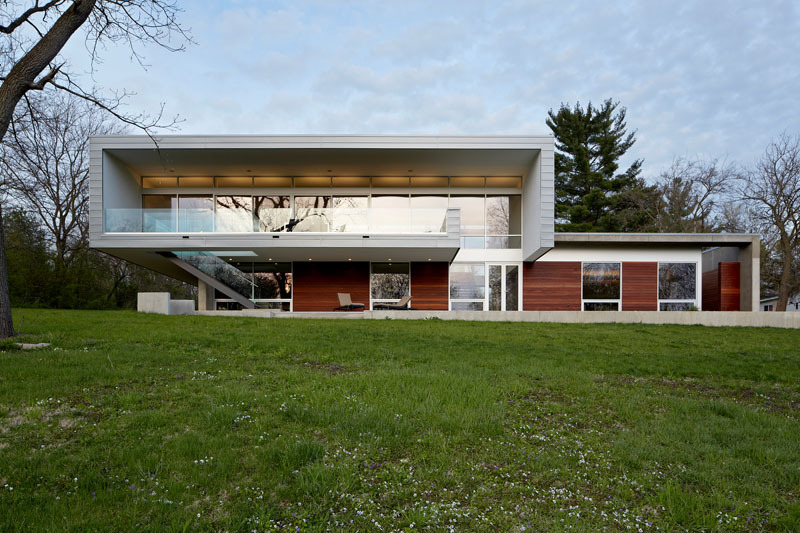 The house is called the Riverview House designed by Studio Dwell. It is a multi-level home located in Wayne, Illinois featuring social areas above it. It also has bedrooms which are situated in the sloping site of the house. 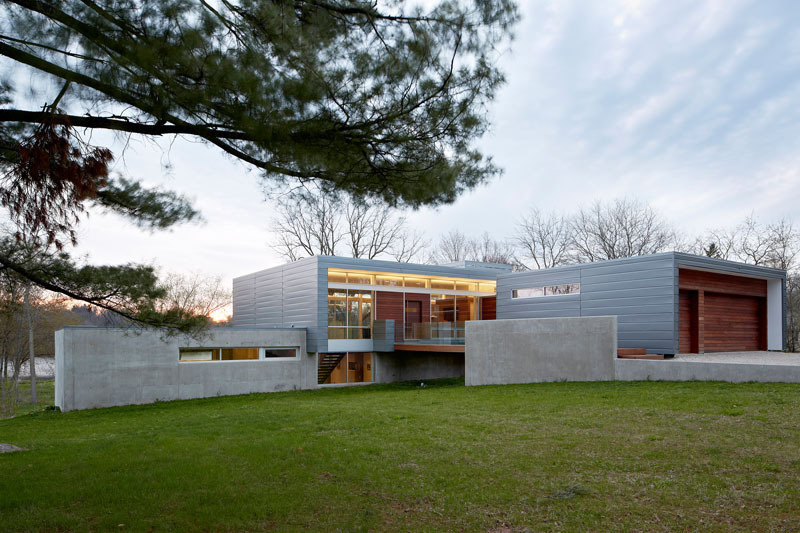 The architecture of the house has a modern style with combined materials aside from the anodized aluminum panels. It also used glass, wood and concrete as well. In the interior, you can see that it use some wooden features too and has a neat modern look from its furniture to its decorations. Let us take a look at the Riverview House below. Unique feature: A multi-story home is clad in anodized aluminum panels and has a modern interior featuring some wooden panels in the living area. 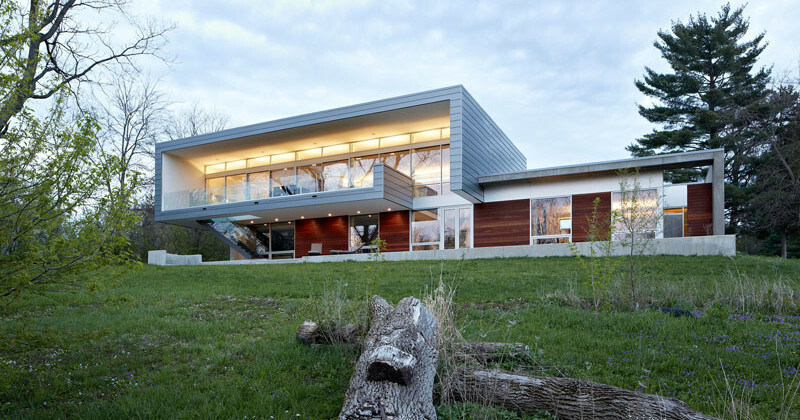 The house has a modern design and at first glance, you can notice its anodized aluminum cladding as well as the wooden sidings on the lower level. What added beauty to it are its use of geometric lines and the mix of materials in it. Seen here is the facade of the house wherein it has a concrete deck that is directly connected to the lower level of the home. 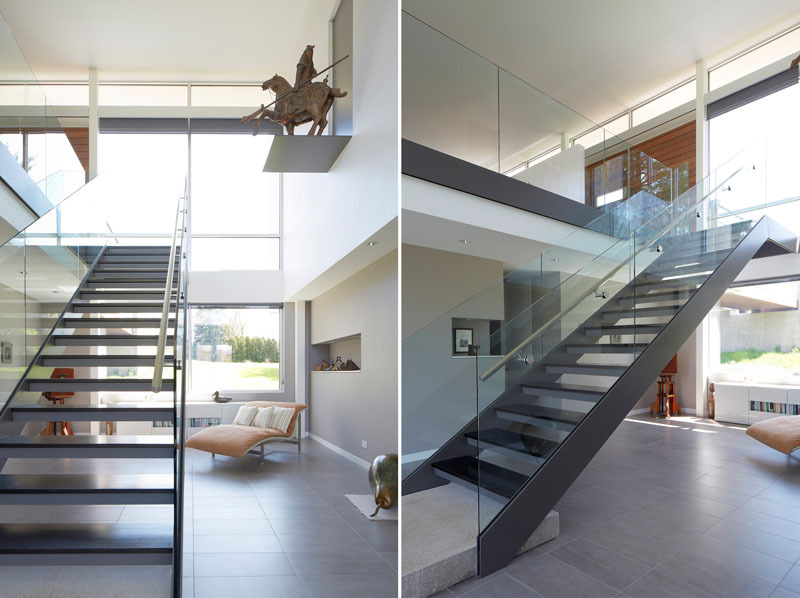 The house has an exposed steel stairs with glass railings that lead to the lower level of the home. It has many available spaces because the house is not crowded with decors and furniture. Because of the windows, the master bath is filled with natural light, and the partial height exposed a concrete wall which separates the bedroom and bathroom. 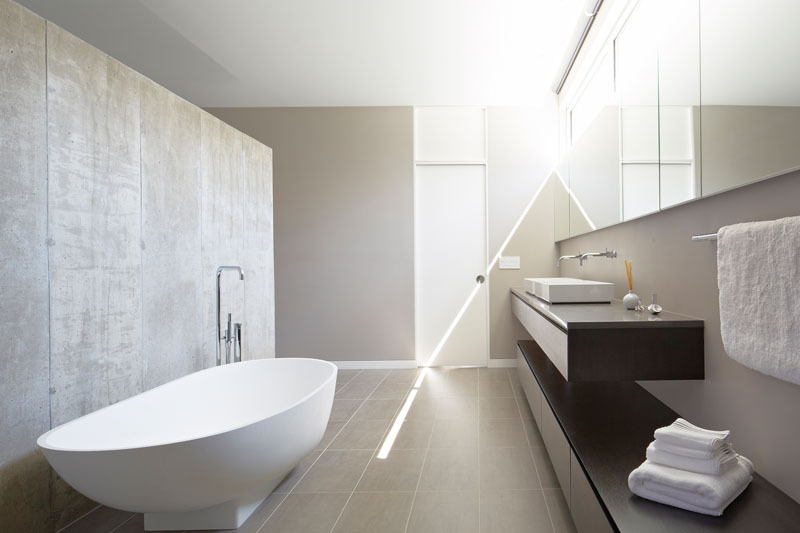 Seen here also is a lovely white freestanding bath tub. 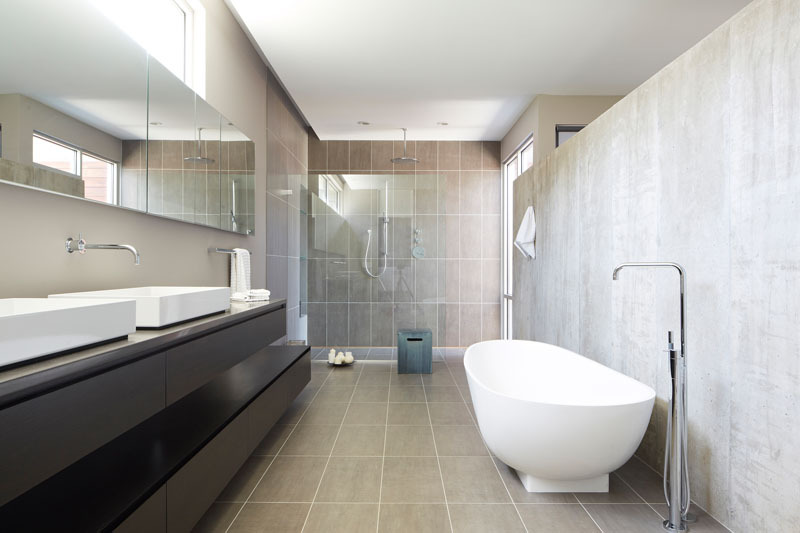 The bathroom also includes a large shower enclosed in glass and it has a rainfall shower head. Notice also that it has a long vanity area with large mirrors. Isn’t this beautiful? The exterior of the house is indeed very lovely especially that it used a unique material. But aside from that, it also has many glass windows that added appeal to the exterior while allowing natural light to get into the interior. Meanwhile, the interior of this house designed by Studio Dwell looks really neat because of its choice of modern colors, furniture and decorations. Although it looks sophisticated, it isn’t crowded and has a lot of space to walk around. What can you say about this house?